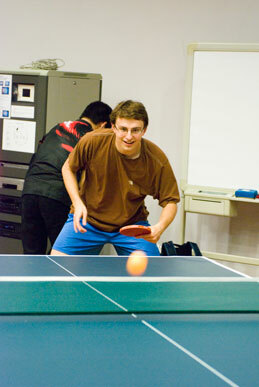 Table tennis is one of the favourite sports of Chinese people. Small as it may seem, it has influenced China’s diplomacy with the United States and has reaped most of the gold medals in international games for China. This year, the Inter-hall Table-tennis Competition of the Professor Edmond Ko Cup has again attracted lots of residents’ participation. Congratulations to Hall 8 & JCH, the champion team who claimed all the matches except one, the men’s singles. Who was the mysterious guy that grabbed this medal? The “dark horse” turned out to be an exchange student from Germany. David, the player representing Hall 6, said he has been playing table tennis for 12 years. However, it was in Hong Kong that he picked up the game again, for he hasn’t played it for almost four years. While the players were doing their very best to win the matches, the cheering teams were competing off the court. Hall 2’s cheering team was especially impressive. Their flags, slogans, props and yelling gave players enormous support. Nico, after attending the congregation that day, came back to the Student Residence to watch the game. “I want to play the game again,” Nico said. Along with a few other graduates, Nico enjoyed the night cheering for the players and finding old friends. Residence Masters were never absent from those exciting events. Alisa (the Residence Master of Hall 9) and her husband, Paul, both came to the site in support of Hall 9’s players. Hall 9 ended up as the 2nd Runner-up, a pretty good result. The support of Mike (the RM of Hall 8 & JCH) made their Hall’s winning the championship very meaningful. Looking back, we see how all members of our community, though coming from different backgrounds, are united in working towards a common goal. Some day, when you graduate, will you come back to see the place where you once lived and were happy? Will you miss receiving encouragement as simple as the words “Carry on” from peers? A small ball reflects a big world. Be ambitious and you will win.